Tyco BMW's British Superbike riders for 2017, Christian Iddon (left) and Davide Giugliano. Former World Superbike podium contender Davide Giugliano has signed for Northern Ireland’s Tyco BMW team as TAS Racing aims to return to the MCE British Superbike Showdown in 2017. The Italian rider will make his BSB debut on the S1000RR and joins Stockport’s Christian Iddon, who has been retained by team principal Philip Neill for another season. 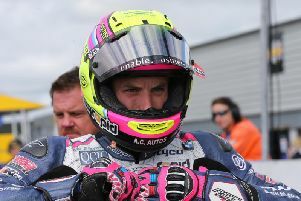 Both Michael Laverty and Iddon failed to make it into the all-important Showdown this year as TAS Racing failed to make the cut for the first time. However, the signing of Giugliano – who finished on the podium five times this season in World Superbikes – is a statement of intent. The 27-year-old rode the Aruba.it Ducati team over the past three seasons but lost his place in the team for 2017 to Marco Melandri. Giugliano, though, is excited by the new challenge he faces and expects the S1000RR to suit his riding style. “I’m very happy to be joining the Tyco BMW team for my first season in the British Superbike Championship. I have ridden on some of the British circuits already during my time in World Superbike, and will look forward to testing and racing on the others next year. “British Superbike is a very popular championship with big crowds and I know the British public is passionate about their racing; a bit like the Italian supporters, so I’m hoping to gain many fans with Tyco BMW next season,” he added. Meanwhile, Iddon will be aiming to build on the knowledge he gained of the Tyco BMW this year and admits he needs to show more consistency next season. “It goes without saying I’m very pleased to have been able to secure a second season with Tyco BMW on the S1000RR. We learned a lot in 2016 and what we did show at both ends of the season was that we are more than capable of challenging at the front, and that’s exactly the plan is in 2017, but more consistently,” said Iddon. Tyco Security Products has agreed to continue as title sponsors of TAS Racing’s British Superbike and international road racing teams for a sixth year. Confirmation of the team’s British championship support class and roads riders is expected this week. With no place for Laverty at Tyco BMW, the 35-year-old secured a BSB deal to compete for Keith Flint’s Team Traction Control McAMS Yamaha squad on the R1 alongside James Ellison in 2017.